Solist Series: Adams Solist xylophones start with a 3 octave desktop model with full size bars in light rosewood. The following models are ether 31/2 octave or 4 octave, booth available in octave and quint tuning. The octave tuned instrument has a clear and brilliant sound and is mostly used in European countries. An octave tuned instrument has the first overtone 2 octaves above the fundamental. The quint tuned instrument has a quint tuned in between the fundamental and the double octave, this results in a clear the and brilliant sound. Quint tuned instruments produces a short, penetrating attack that cuts though the largest orchestra and ensemble. Light rosewood is a hard, good sounding wood for a very affordable price. Honduras rosewood has long been considered the perfect for the production of mallet instruments. A rich balanced sound is the result when Adams’ skilled craftsmen produce bars from the selected Honduras rosewood. 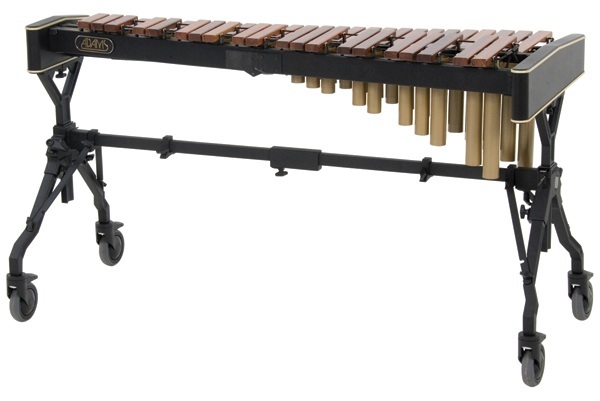 All xylophones are with Adams patented height adjustable voyager frame. Rails and resonators are fold in half for easy transportation.